Custom-name up to 100 locations to (instantly) teleport to, in or out of PA/Doors/Combat. Boston Airport - Points to correct marker now. Rename Marker - No longer shows an additional marker in menu after renaming. Completely re-wrote the mod. Uses zero assets from PTD. May use both together. Added a "Summonable Trunk" that you can retrieve and return at will. 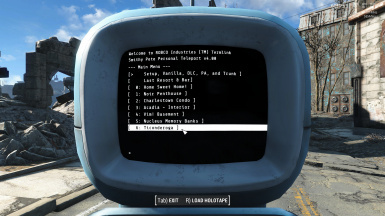 Added built-in teleportation for Institute, Prydwen, Railroad, and Overboss's Quarters. Added ability to send summoned Power Armor back to where it came from. Added ability to choose how much fuel you use (10%, 20%, or 50%) (by request). Added pop-up message for when you are out of fuel (by request). No longer requires any DLCs, but will still benefit from them. Added the 30 settlements from vanilla in a separate menu. Added the 7 settlements from DLCs to the DLC Pack version. Added a "Summon Power Armor" feature to main menu. Added optional usage of Fusion Cores as fuel. Added an optional "Activator" to activate the Courser Chip from a hotkey. See description. PTD now looks like a Courser Chip (by request). Companions now arrive the same time that you do! No more waiting on the game to realize you've moved! Brief: Custom-name up to 100 locations to (instantly) teleport to, in or out of PA/Doors/Combat. 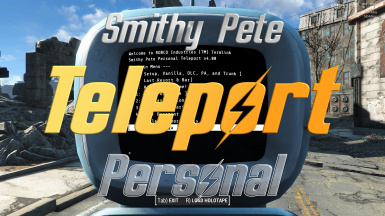 Description: Personal Teleport that allows you to customize up to 100 teleport locations, including the name, and always remembers the last location (Last Resort & Bar) that you used the terminal to teleport from. Use the Personal Teleport to teleport to/from indoors, to/from outdoors, DLC areas, inside/outside Power Armor, in/out of combat. It just works anytime! And you only have to set up each customizable entry once! Fuel Usage: Optional fuel usage allows you to use Fusion Cores as fuel. Options include 5-30% drain per use. 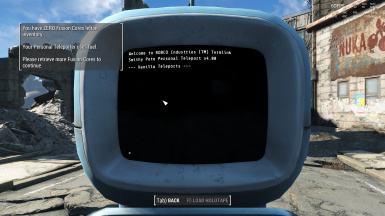 A message will pop-up if you attempt to use PT without any fuel left (if fuel usage is enabled). Extras: Includes a few select locations from Fusion City Rising, Outcasts & Remnants, and Project Valkyrie. Compatibility: Compatible with EVERYTHING! With or without any DLCs. Place anywhere in your load order. Doesn't matter. Thanks: registrator2000 and Neanka for existing; ianpatt, behippo, and purplelunchbox for Fallout 4 Script Extender; registrator2000, Neanka, and shadowslasher410 for Mod Configuration Menu; Neanka for TextInputMenu; registrator2000 for Rename Anything; and Elminster, Sharlikran, Zilav, and Hlp for xEdit (TES5Edit). Q: Why do you require so many hotkeys just to use this single mod? A: I don't. The MOD only requires ONE hotkey to function properly. 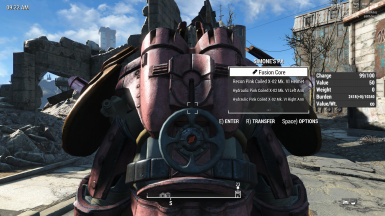 Q: Why to you require fuel (fusion cores) to use this mod? A: I don't. It's optional. Q: Why even have it as an option? A: Because players whined and complained until I added it. Other than that, I'm not actually sure why I added it. Q: What is the Last Resort & Bar? A: It's a marker placed at the last location you teleported from (using the Personal Teleport). Q: Why did you name it "Last Resort & Bar"? A: 'Cause SOME players think it breaks "immersion" to be named "Last Teleport Marker", whatever "immersion" means (in a game). Q: Why did you eliminate the Map Markers (except for the Last Resort & Bar)? Q: Why does my custom power armor sometimes have "PT Power Armor" as a name? A: Already answered in the description, above. Q: Why does my storage trunk sometimes seem to be at the wrong angle? A: Same answer as the question directly above this one. Q: The pictures only show six or seven custom markers, NOT 100 like you claim! A: Is there a question? It's a static picture. I didn't feel like going all around making custom markers. I could've faked it, but decided not to. Q: Ha! The pictures only show FIVE or SIX custom markers, NOT six or seven like you just claimed! A: Still waiting on the question. Please re-count. Q: Why do you use Creation Club content in your game? A: 'Cause I want to. Q: Why did you include some non-settlement places, and not others? A: I had better things to do. 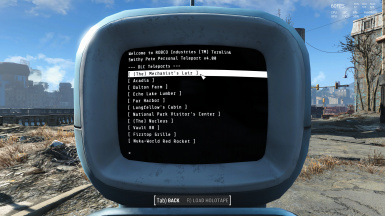 If you knew how many HOURS I spent JUST setting up the ONE HUNDRED custom markers you can use, well, you MIGHT appreciate why I didn't include Wattz Consumer Electronics or Rocky Narrows Park in the pre-fab Vanilla/DLC lists. 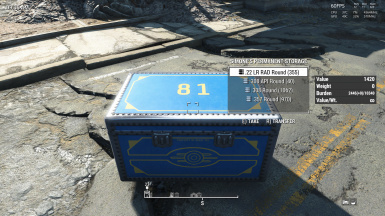 Q: Which power armor and/or storage trunk is the "primary" one? A: Index 0, marked with an asterisk (*). 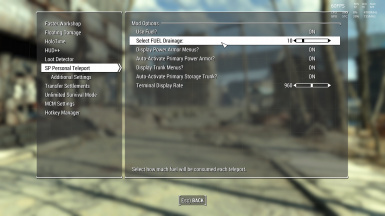 Q: What is this whole "locking and unlocking" power armor about? 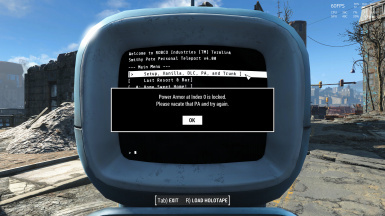 Q: I accidentally deleted a power armor, after confirming my choice to do so in that annoying pop-up warning. How do I get it back? Q: But I had some expensive customized pieces on it! Q: In the pictures, why does your character seem to have a female name? A: I'd rather stare at women than hairy, sweaty guys while playing. Sue me. 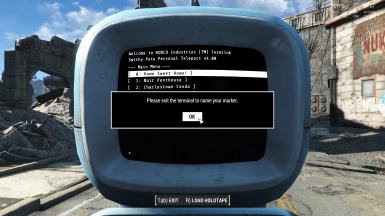 Q: Why do I have to exit the terminal just to name/rename my custom marker? A: Game limitation while using TextInputMenu (TIM). Q: I don't like the suggested name that it shows! Q: Why did you suggest that name? A: Ralph, at Bethesda. Give him a call. Q: Well, I'm not going to use that suggestion. Q: What's "Toggle Radio" about? 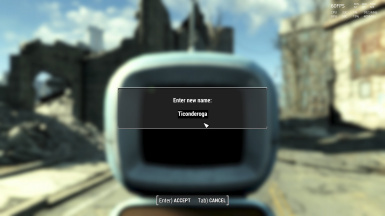 A: It allows you to assign a hotkey to toggle your in-game radio on and off. Q: What about "Interior Fast-Travel"? A: It allows you to assign a hotkey to enable fast-travel from an interior. Works most of the time. Q: But there are already mods which allow fast-travel from an interior! A: Yup, and one is mine. That's why nobody is forcing you to assign a hotkey to it. 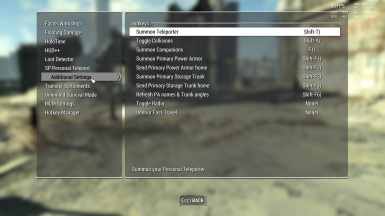 Q: Why did you include an option to "Summon Companions"? 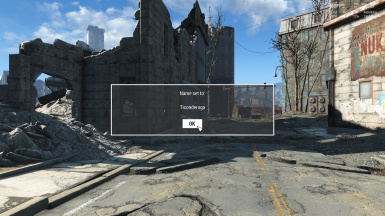 A: It was already there (in this mod), so I just decided to give the player the option to access it directly. Q: What is this "Terminal Display Rate" thing about? Q: I changed Terminal Display Rate, but nothing happened when using a terminal. Still slow/fast as ever. 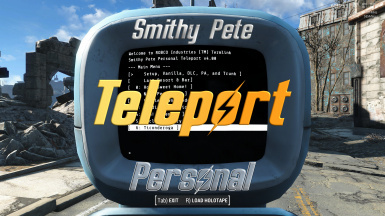 A: It won't take effect until you use the Personal Teleport terminal again. 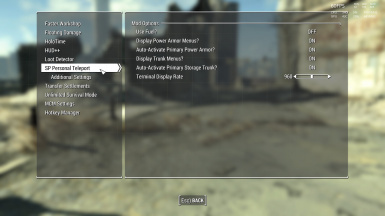 Q: Don't other mods change the Terminal Display Rate, as well? Q: Won't this setting conflict with their setting? Q: What is this "Collision Toggle" about? Q: Isn't this entire mod cheating? Q: But you are ruining the ENTIRE game by making this mod! A: Sweet! Thanks for your kind words! Q: On fuel usage, I want to be able to do xyz, instead. A: Cool. Goals are good. Q: I ran out of Fusion Cores, and now I can't teleport! A: Who enabled using fuel??? And who can disable using fuel??? Q: Are you an ahole? Q: Will this F.A.Q. section ever end?